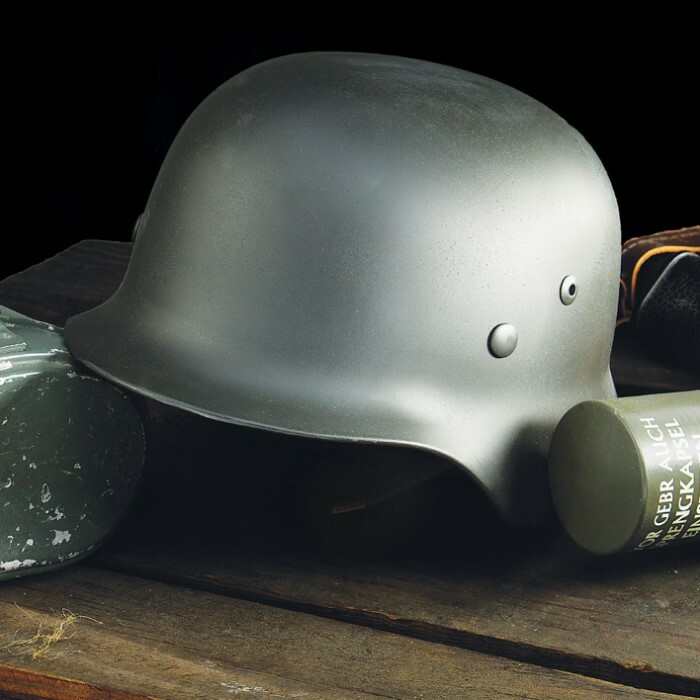 1942 Replica German Military Helmet | BUDK.com - Knives & Swords At The Lowest Prices! This helmet mirrors the helmet worn during WWII by German soldiers. This style actually influenced the design of modern military helmets because it provides the ultimate protection in battle. This reproduction is a M35 stahlhelm and not the M42 helmet as it says. However i was very satisfied with this helmet, it was extremely cheap compared to other businesses that sell stahlhelms ( most reproductions are $80 or more) It also has an incorrect color, its more blueish instead of the Field Grau color. If you want to use this helmet for display, airsoft or reenactments this is a cheap helmet for you and if you do want to use this for reenactments i suggest buying a helmet cover. 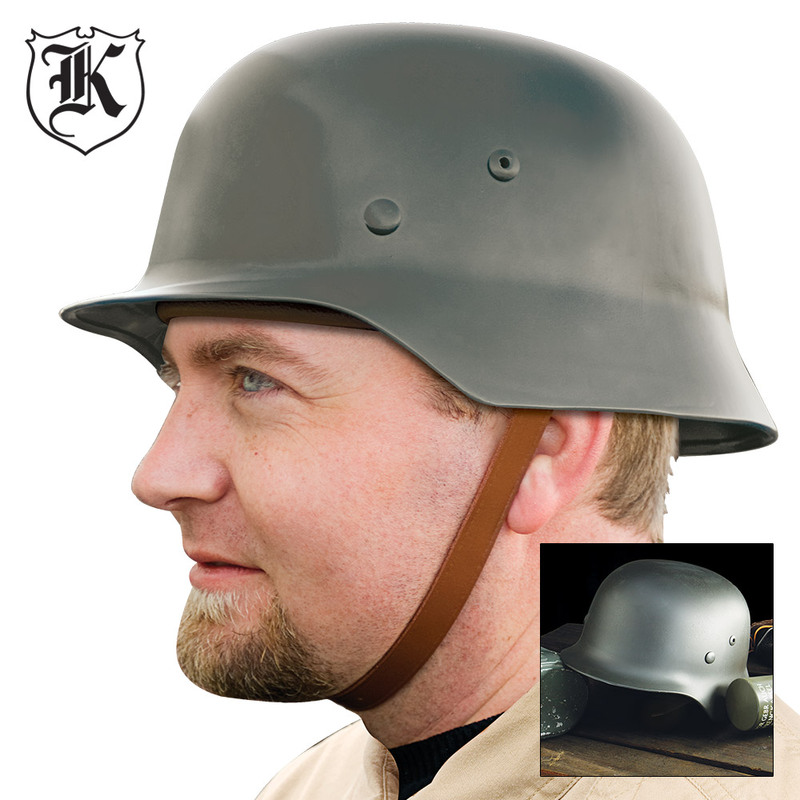 Overall it is the cheapest stahlhelm on the market and you will not regret buying it. The helmet was well packaged and arrived in a timely mannor, however, the rolled edge was poorly finished, the color is not correct, the suspension system is of questionable quality, the rear rivets were all lose. The helmets price is comparable [but lower by $10] than the closest rival. The helmet is made in China and the helmet is missing all markings that would have been found stamped into an original, the made in China decal was difficult to remove. This helmet will pass muster if it is not examined too closely and is used for a display. As far as the decals, I had no difficulty with them, they are simple water transfer and need care in application as for the excact placement on the helmet there are many historical photos of the helmets in combat available online and in books. Over all a fairly good deal, sure beats $150+ for an original! WILL NOT BE DISAPPOINTED WITH THIS ITEM, GREAT LOOKS, BUILT STRONG GOOD WT. WELL WORTH THE MONEY TRUST ME, PICTURE ON THIS PAGE DOESN'T DO THIS ITEM JUSTICE, GREAT JOB !! WELL DONE, PICTURE DOESN'T DO THIS ITEM JUSTICE, LOOKS GREAT ALONG SIDE OF MY REAL ONES. GREAT DESIGN WAY UNDER PRICED, NICE UNIT. I bought this helmet and was impressed with the quality of this item, well done and well worth the $. Its quality stands out with my real ones side by side, barely tell the difference. Also bought 2 from another co; and was disappointed by way more $ an less of a helmet, budk this is great an will continue buying. Also most of your German knives and daggers are great as I have bought 3 with no regrets. THIS IS TRUE A GREAT QUALITY HELMET, I'M A COLLECTOR OF ALL WAR, BUDK KEEP UP THE GOOD WORK ON YOUR PRODUCTS, ANYBODY THAT DISAGREES DON'T KNOW THERE HISTORY, AND TWO ALL BE THANKFUL THAT THE THINGS YOU GET AT BUDK.COM. No idea where BudK got the idea that was a 1942 model helmet. What I got was an amazingly well done reproduction of the M1935 helmet right down to the 1931 style liner system right down to the square chinstrap rings. This repro is easily equal of items priced three times as much. Perfect for reenactment! Now, on the downside, these aren't sized so it's pretty much a crap shoot. The helmet I got is fairly large but, obviously, the one on the guy in the picture is way too small for him. Mine fits me just fine.